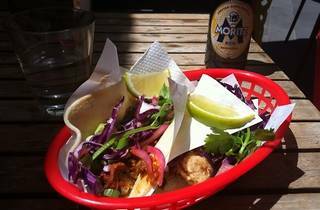 So, on top of running the most renowned Spanish tapas bar in town, the MoVida crew have started boosting tacos and tequila from a shipping container on their roof. Surrounded by tables, and shaded under a big yellow tarp on the terrace this is a van with a plan convert city lunchers to the way of the taco – and to lunchtime drinking. The list of Tromba tequila based cocktails, fruity wine filled sangria and beers here (Moritz and Pacifico lagers front-and-centre) are hard to go past at high noon. With the black and white menus plastered above the order windows, the place looks and operates like your school canteen – so long as you went to a school with hot dudes in place of burly dinner ladies. 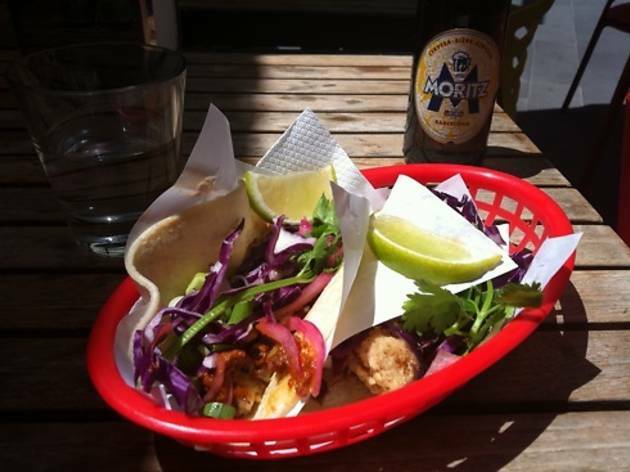 The soft white corn tortillas here come rammed with six flavour options, amongst them fragrant slices of fatty duck, or semolina coated and deep fried chunks of white fish with a smoky chipotle pepper sauce. All are topped with a handful of purple cabbage, green onions and coriander for fresh crunch. Being in the busy business district they've built these tacos for speedy service, so while on the one hand you get a quick snack stacked with quality ingredients, we’re deducting points for unwarmed tortillas and on our visit pre-cooked fillings. With a layer of their complimentary sunscreen on, we'd be happy to sit back and wait longer while fillings are cooked to order. Still, the house made marinades have spice and piquancy rather than just heat, and an ice cold Paloma (the classic Mexi highball of grapefruit soda and tequila) will set your dial to party in ten seconds flat.